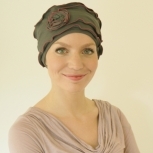 Elegant evening womens cocktail hat that completely covers the head, low onto the nape of the neck. 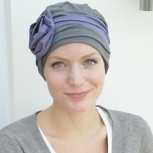 The style is called Ava and designed by Suburban Turban. It is made from super soft viscose jersey, with a black perma-creased satin fabric that is gathered over to one side. The style is hand finished by our milliners and you can either wear it with, or without, the crystal pin that it is sold with. *** NEW *** a choice of pins is now available with this style. An art deco sequin pin in either 'Pewter' or 'Periodot' (pale green). Please specify which pin you would like when ordering. It has a definite feel of the 1920's about it and the elegance of the 'Great Gatesby' era! The style adds height to your face profile and soft fullness all the way round the head. It is the base jersey hat that provides the super comfy fit. 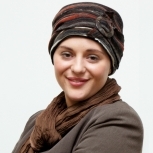 Beautiful and unusual modesty headwear. Hat should be machine washed cool at 30C/86F to maintain fit. No need to press, just shake and leave to dry. We make and size all our hats please leave your size IN THE COMMENTS BOX WHEN YOU ORDER. S = 20.5"-21.5", M = 21.5"-22.5", L = 22.5"-23.5" but we can adjust and make to any head size - just let us know your headsize. Item ships from: Westcott, Surrey, UK. $5.80 USD ($1.00 USD when combined with another item) by Airmail. $5.80 USD ($1.00 USD when combined with another item) by Airmail Post. Please be aware our products may attract PST and/or HST tax. We are not experts on border legislation and advise you to investigate possible tax charges before ordering. We cannot be held liable for custom duties/taxes. Further information can be found at the Post Canada website. If you are unsure how to measure your head please copy this help link into your browser - http://www.suburbanturban.co.uk/hat-size-guide/ - it will explain where to place the tape measure! Please return items to us within 30 days of purchase and we'll be happy to exchange or offer you a refund. If you are intending to return/swap an item please email us as soon as possible and we will make a note on your order/account. ***important*** the buyer is responsible for shipping costs on returns and exchanges.